Government agencies, private companies and research organisations generally do a great job of seeing their data as an asset, but they have to overcome many difficulties to use it as one. Creating quality data and metadata is a difficult, manual and thankless process, and once a dataset is created it’s hard for data creators to see how their data is being used, or whether it’s being used at all. Using data is no easier - data tends to sit inside silos formed by the teams who collect it, invisible and inaccessible to others in the organisation. Even if datasets are able to be seen and used they’re hard to find due to poor metadata and search functionality, and once a dataset is found there’s no way to know whether it’s reliable or up to date. Magda is an open-source software platform designed to assist in all areas of the data ecosystem, from collection and authoring, through internal discovery and use, all the way to sharing inter-organisation or publishing on an open data portal. 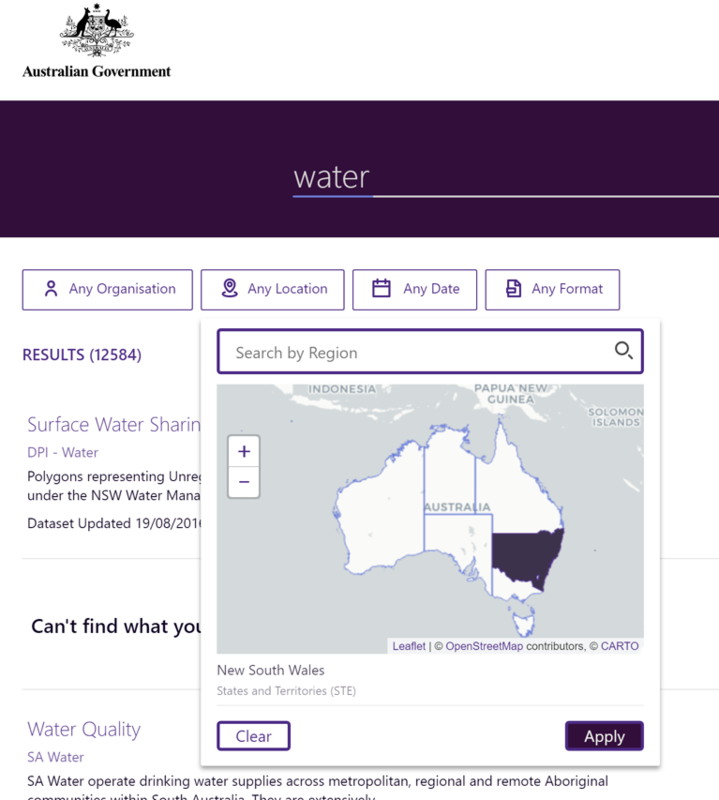 Originally developed as an open data aggregator for data.gov.au, after extensive research how data is used in the publich, research and private sector, it is now being extended into a set of components that can be arranged for many use-cases - internal private data portals, public open-data aggregators, limited data access portals for organisational partners, or any combination, with various users able to access different datasets depending on their permission level. The easiest way to find a dataset is by searching for it, and Magda puts its search functionality front and centre. Magda is able to rate datasets by their quality and return the best ones at the top of the search, understand synonyms and acronyms, as well as provide a number of advanced filters including the ability to search for datasets that affect a certain spatial region or a time period. Magda was originally developed to power data.gov.au, which aggregates over twenty different sources, and as a result being able to federate with other data sources is a first-class capability. Magda can be used to seamlessly combine many open data portals into one, easily-searchable repository, or an internal data registry can be enhanced by importing relevant open data sources and having open datasets appear beside private ones. Ensure that your users can quickly determine if a dataset is useful for them with charting, spatial preview with TerriaJS and automatic charting of tabular data. The metadata that describes datasets is often poorly formatted or completely absent, making them difficult to search for and understand. Magda is able to enhance the metadata of both locally hosted and external datasets in by checking for broken links, normalising formats, calculating quality and determining the best means of visualisation. Magda is designed as a set of microservices that allow extension by simply adding more services into the mix. Extensions to collect data from different data sources or enhance metadata in new ways can be written in any language and added or removed from a running deployment without downtime and no effect on upgrades of the core product. Magda uses Kubernetes and Helm to allow for simple installation and minimal downtime upgrades with a single command. Deploy it to the cloud, your on-premises setup or even your local machine with the same set of commands. Authoring a quality dataset is hard - not only does it involve a lot of manual work, but it also requires a great deal of up-front knowledge and data literacy. We’re building a guided, opinionated and heavily automated publishing process into Magda that will result in an easier time for those who publish data, and higher metadata quality to make it easier to search and use datasets for data users downstream. Confidence in data-driven policy and decision making is compromised if users can’t be sure they have the most recent version of a dataset. We’re building in features to keep data users notified when datasets that they use are updated, keep track of duplicates, and reduce the need for duplication by enabling more analysis to be done without the need for downloading artifacts directly. A common complaint among data publishers is that they don’t know how, how much or even if their data is used in order to prioritise their work. This gets worse at an organisational level: managers aren’t able to make decisions on how to prioritise investments in data because they don’t know how their existing data is being used. Magda will collect analytics on how data is used, at both a fine-grained and high level. Magda will also expand on its existing ability to collect feedback and foster communities around data. We’re currently looking for more co-creation partners, so if you’re part of an organisation that uses data and this sounds like something you’d like to be a part of, we’d love to talk to you! Please get in contact with us at contact@magda.io. Magda currently powers Australia’s open data portal data.gov.au, serving tens of thousands of users per week. Magda is also used by CSIRO Land and Water’s Knowledge Network, as well as the Australian Federal Department of Agriculture and Water Resources and Department of the Environment, in internal-only instances. Want to get it running yourself? We welcome new contributors too! please check out our Contributor’s Guide. The project was started by CSIRO Data61 and Australia’s Department of Prime Minister and Cabinet. It’s progressing thanks to Data61, the Digital Transformation Agency, the Department of Agriculture and Water Resources, the Department of the Environment and Energy and CSIRO Land and Water.